When I called my Grammy to ask for the recipe for the fabulous Lemon Cream Pie she bakes every Easter, I expected her to reach for a classic cookbook or a magazine article she’d clipped. Little did I suspect that the source of this luscious, citrusy lemon-lover’s dream was a 1960s cream cheese package. To be specific, this Lemon Cream Pie recipe (or rather, my Grammy’s inspiration for it—as with any experienced baker, she’s made her own changes over the years) hails from a 1960s cream cheese cookbook pamphlet my Grammy received by mailing in a coupon clipped from the back of her cream cheese package. Decades later, her family still sits down to devour Lemon Cream Pie. The pamphlet, titled Philly Pies, contained about 10 cream cheese pie recipes total, and while I’m not sure which other ones my Grammy may have sampled over the years, today’s no bake lemon cream cheese pie is the one that has earned a place in our Easter tradition. In my family, we are serious about our holiday meals, especially our desserts, so I assure you that if you try this Lemon Cream Pie, you will understand why my Grammy has been baking it all these years. 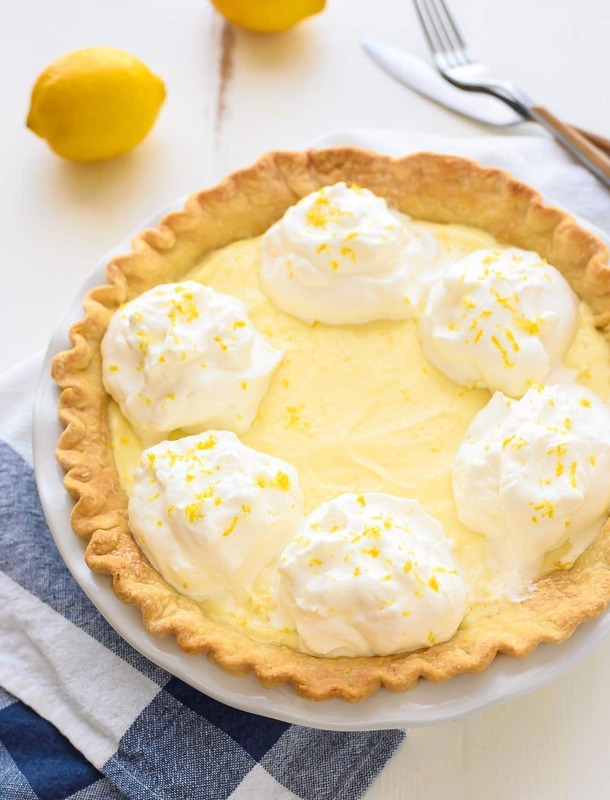 Although you might find many other no bake lemon pie, lemon cream cheese pie, or lemon custard pie recipes online, you will not find this one—believe me, I looked. Every lemon cream pie I found used a combination of instant pudding mix, canned condensed milk, and/or whipped topping from a tub. While these shortcuts each have their place (and Grammy herself is not above using occasional mixes or premade products where she feels the taste is equivalent), she has stood firm on making Lemon Cream Pie from scratch, because the results are worth it. Spend a few extra minutes juicing real lemons, stir them together with real eggs on the stove, and watch the magic as they thicken into the richest, most luxurious lemon custard you’ve ever tasted. Try your hardest not to devour the entire bowl of creamy filling before you’ve poured it into the pie crust. Top the lemon pie with homemade whipped cream. Lick the spoon. 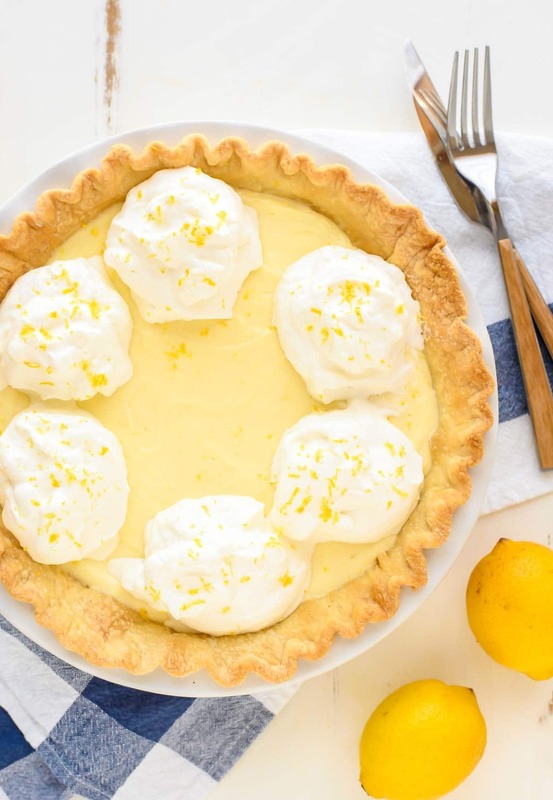 From the 1960s to your table: the best-ever Lemon Cream Pie. Grammy, thanks for mailing away for that pamphlet all those years ago! The best lemon cream pie you will ever taste! Original 1960s recipe made from scratch with fresh lemon juice, cream cheese and real whipped cream. Preheat the oven to 425 degrees F. Roll out the pie crust, then fit into a 9-inch wide pie plate that is 1 1/2 to 2-inches deep. Trim any overhang, then crimp the crust edges as desired. Line the crust with aluminum foil or parchment paper so that the foil/paper comes all the way up the sides of the dish and fits against the sides and bottom snugly. Fill the dish with dried beans or pie weights. Place in the preheated oven and bake until the edges are barely beginning to turn golden, 12 to 15 minutes. Remove the foil/paper and weights, then return the crust to the oven and continue baking until the bottom looks dry and lightly golden and the edges have browned, about 5 to 8 additional minutes. The bottom of the crust will puff a little as it bakes, but it will deflate again once removed from the oven. Let cool completely. Place a heatproof bowl over a pan of lightly simmering water to create a double boiler. Add the eggs into the bowl, then with a hand mixer on medium speed (or a whisk and some serious arm power), beat the eggs until thick and fluffy, about 2 to 3 minutes if using a mixer. With the mixer running, slowly add the sugar, then the lemon juice and lemon zest. Once incorporated, switch from a mixer (or whisk) to a rubber spatula. Continue to cook the mixture over the simmering water, stirring constantly and scraping the bottom of the bowl with your spatula, until it forms a thick, smooth custard, about 8 additional minutes. When you dip your spatula into the custard, the custard should easily coat the spatula's back, and if you draw a line through the custard on the back of the spatula with your finger, the sides of the custard should stay separated. Remove the bowl from the water and let cool to almost room temperature. In a large mixing bowl or a standing mixer fit with the paddle attachment, beat the cream cheese on medium high speed until it is completely soft and smooth, about 3 full minutes. Reduce the mixer speed to medium, then gradually add the cooled lemon custard to the cream cheese, beating until smooth and fully combined so that no white streaks remain. Pour the cream cheese into the baked pastry shell. Refrigerate the pie until fully chilled, at least 4 hours or overnight. Up to 4 hours before serving, prepare the homemade whipped cream: In large mixing bowl or the bowl of a standing mixer fitted with the whisk attachment, beat the cream in the bowl of an electric mixer fitted with a whisk attachment over medium speed. When it starts to thicken, add the powdered sugar and vanilla, increase the mixer speed to high, and continue to beat until soft peaks form. (Do not over beat or the cream will separate.) Spread over the chilled pie, slice, and serve cold. *My Grammy uses full fat cream cheese. I used reduced fat cream cheese to make the pie a bit lighter, and thought it was still plenty rich and creamy. Feel free to choose whichever you like—just do not sure fat free cream cheese as both the texture and flavor will be off. This literally has my mouth watering, and I love that it uses REAL ingredients — this is a must make! This cake is positively lovely! Your Granny is one excellent baker! PINNED! Grammys always know best, especially when it comes to pie. Love that this is a vintage 60’s recipe and that your Grammy was dead set on making it from scratch. Looks like the perfect treat to add to our Easter dessert spread! 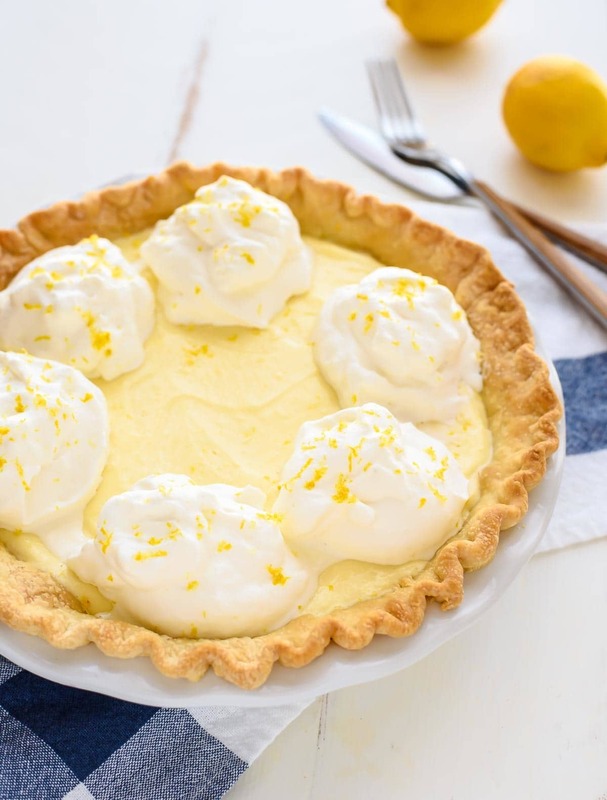 This lemon cream pie looks absolutely dreamy! I recently learned that the recipe for one of my family’s favorite cakes came from an old cocoa box – I was probably as surprised as you were. Thanks so much for sharing this recipe! oh yummy! This would be so good! I love anything lemon! I love citrus and lemon is my favorite. This will be a great addition to my Easter dessert table. Family recipes are the best!! I’m crushing on this – lemon anything is my favorite!! So bright and cheery. Great pie recipe! Just made it tonight and it’s going to be an Easter tradition from now on! Thanks for sharing. Heidi, I am so happy to hear this and will let my Grammy know when I see her tomorrow. Wishing you all a very happy Easter! Thanks for trying the recipe and for taking time to let me know how it turned out for you. Is this more like a lemon cheesecake? It seems to have the same ingredients. Hi! Although it has cream cheese in it, it’s much silkier, fluffier, and less dense, like a cross between a lemon meringue pie and a cheesecake. I hope that helps! Oh my, made your Grammy’s pie. It’s TRULY DEVINE!!!! I am so happy to hear that Cindee and will let my Grammy know too! Made this pie yesterday and it turned out fabulous. I shall wow my guests on the second pie…. After almost half an hour, my custard never became custard. It was more of a runny pre-lemon meringue filling without achieving the thick texture. I might as well make a lemon meringue filling and add some cream cheese to it next time. Hi Carrie, I’m sorry to hear the custard wasn’t thickening up for you. I know it’s frustrating when a recipe doesn’t work out as planned. Although the recipe has worked great for me and for others, it can be hard to figure out what went wrong since everyone’s kitchen is different! I truly wish that it had turned out! Carrie, I’ve made this pie twice now. The first time, using my old electric stove, it took about 25 minutes for the custard to thicken. The second time I made it on a gas stove and it still took about 15 minutes. Everyone’s bowls/pans are different. Ignore the time, turn the heat up a tad, and keep stirring. Believe me, this pie is WELL worth the wait! Thanks so much for sharing your experience, Toni! It’s really true that everyone’s kitchen is different. WOW! Was I happy to find this recipe! The fresh ingredients and ample amount of zest and lemon juice is what caught my eye. I was intimidated at first with using the double boiler but I followed your directions and it came out perfectly. My husband and I couldn’t quit “sampling” it. We are having our family Christmas today and it will be front and center. Thanks for a great recipe. Have you tried making it with lime and using a graham cracker crust. We are big fans of Key Lime pie but don’t have a decent recipe. Hooray! I’m so glad the recipe turned out perfectly, Janet. :) I haven’t tried making this with limes and a graham cracker crust, but that’s a good idea and I think it could work! My husband is looking for a pie with a vanilla wafer crust and meringue on the top do you think this would work? Hi Debi! While you could swap a vanilla wafer crust (you’d want to prebake it, since the pie filling is only chilled, not baked), I’m not as sure about the meringue. 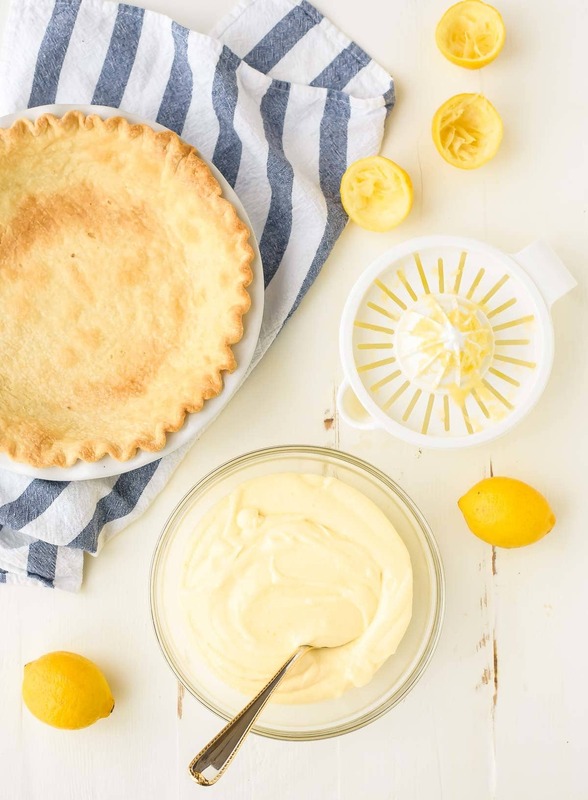 Usually meringue has to go on top of the pie and into the oven, and I think that this delicate lemon pie filling would melt into a mess underneath it. I’d suggest looking for a classic lemon meringue pie recipe and doing it with a wafer crust. Ina Garten has a good one, and you can find many options online. Thanks and good luck! Just made it as a pudding only. This filling is delicious. I made it with Meyer lemons, which are plentiful in southern Calfornia at the moment. I suggest keeping the water at a very low simmer, and make sure the hot water doesn’t touch the bottom of the custard pan. Otherwise, the eggs can scramble. You can pass the hot custard through a sieve to remove lumps. If you plan to do this, add your lemon zest afterwards, or the sieve will snag the zest. Plenty of lemon flavor will infuse while the custard chills. I suspect that if you get a lot of lumps because the eggs scrambled, there won’t be enough egg left to enable the custard to firm up. Since there’s no starch in the recipe, it’s all up to the eggs. For best results, chill overnight before serving. If you can wait that long. I’m so glad to hear you enjoyed the filling, and I appreciate your sharing the extra tips about the water bath. It’s definitely smart to add the lemon zest at the end if you do decide to strain the custard through a sieve! Thanks for taking the time to share this review! Just made this and it was soooo delicious. Everyone absolutely loved it! I actually goofed it up and forgot to mix the cream cheese in with the lemon. After it had chilled overnight and I saw the cream cheese in the fridge I realized my mistake. I decided to improvise by putting the cream cheese in with the whipping cream, spreading it across the entire pie, lightly sprinkling powdered sugar on that with some lemon shavings for color. It was a two layer pie that everyone that was amazing. Love your site and all your recipes Erin!! I’m so glad you loved the pie, Peg. Great thinking with the improvised cream cheese topping! Thank you so much for taking the time to leave this review and for your kind words about my site! I truly appreciate it. Hi Brooke, yes, this recipe can be doubled. I would caution though that it does already make a lot of filling. My grammy’s recipe, which is what I based this lemon pie on, is already 1.5 times a standard lemon pie to make it extra deep and decadent, so you’ll want to be certain that you have a very large mixer that can handle it! I am so glad I found this recipe! It is truly divine and I love recipes that are from scratch!! The directions are spot on and the details really helped me. Just when I was afraid the custard wasn’t going to thicken, it started too. I highly recommend using a timer. – I made a graham cracker crust instead and loved it! – I used 8oz block of cream cheese because I only bought one and it still turned out amazing! – instead of one pie I made three small pies. Using the graham crust made it easy to do this. I was even thinking you can make this in muffin cups or clear cups for individual servings. – I used two tablespoons of powdered sugar in the whipping cream because one didn’t seem like enough for my taste. I am really looking forward to making this for Easter! HOORAY Katie! I’m so glad the recipe was a winner for you! Thank you so much for taking the time to share your tweaks, and I really appreciate your taking the time to share this review! I tried this lemon cream pie with yogurt cream cheese instead of regular cream cheese and I must say it was delicious. Yogurt cream cheese has a lot less calories. Thanks for such a great recipe. Hi Marjie, thank you for reporting back and sharing your tweaks! I’m so glad to hear you enjoyed the recipe! Excellent recipe. Very strong lemon flavor, sweet, creamy and very delicious. We loved it. Thank you! Oops, reading other reviews I just realized I only used an 8oz block of cream cheese instead of 12 oz. This may explain why the lemon flavor was so intense. I might keep this mistake because the intensity was what I loved most about the pie and there was still plenty to go around. My pie didn’t firm up completely by serving time but it wasn’t a problem. Mary, if you are happy with the results that is all that matters! I’m so glad that you loved the pie so much. Thanks for taking time to leave this wonderful review and rating too! Fabulous recipe. It is delicious and super easy. Thanks for sharing! Melissa, I’m so glad to hear you enjoyed the pie! Thanks so much for taking the time to leave this awesome review! Just made this recipe for an event and had some issues with it. Made a double batch and used a 3 qt heavy saucepan over direct heat (med to med-low) on an electric top instead of the double boiler method. Used room temp eggs. Maybe they could have been larger but the box was labeled large. Tried to go by the times but ended up mixing the eggs a bit longer I think initially. Added the zest right away and while it didn’t scramble the eggs, even over the direct heat, the zest did stick to the beaters. Maybe I should have minced the zest. Misread the directions too about the filling is supposed to separate on the back of the spatula, not in the pan itself. I cooked the filling for probably 30 min waiting for the filling to thicken. Had it up to a boil for well over 15 minutes. Despite that, it never really thickened like my other cream pies do but then again those ones have flour and/or cornstarch as thickeners. I mixed the cream cheese for about 3.5 minutes before adding the filling. Even after letting it mix for a few minutes it contained little chunks of cream cheese. Cream cheese had been out all day (16+ hours). I might use the whisk instead of the paddle next time. And the zest clumped on the paddle, too. When I put it in the fridge both pies seemed on the runny side. For what it’s worth this recipe weighs right around 700 g in case you need to make multiple batches and are looking for consistent weights. I usually strain my cream pies but didn’t on this one bc I already added the zest. The event is tomorrow. I’m curious to see what my customers think. Hi Kris, thanks for letting me know about the different changes you made! There are variety of things that could’ve affected the way the recipe comes out (many of which you listed), and doubling recipe sometimes affects the outcome too. I hope everyone enjoys it! This is a follow up to my previous comment… btw, I forgot to mention I live in WY (high desert) at 6100 ft so maybe the elevation impacted how the recipe came together. Lemon wasn’t as popular a flavor as I had hoped it would be so I only sold a couple slices. I thought it would be fitting following a cajun shrimp boil. Anyway, had some slices leftover so I actually got to try it myself. Definitely on the tart side! I would even go so far as saying sour. A little acidic, too. That side, I think for a lemon lover, this is exactly the desired flavor profile. I was worried the filling was soft and runny; it wasn’t. Firmed up great. Was a little worried about the lemon zest causing a texture issue. Still unsure about that but I doubt it would be able to impart enough flavor if I sieved it out right after I added it. No noticeable white streaks or clumps from the cream cheese like I thought. I didn’t taste the cream cheese either, just strong lemon. My wife tasted it and said it was better than any lemon meringue pie. Truth be told I came hunting for a recipe that would mimic the Lemon Supreme Pie I had at Perkins in 1998. It was layered with a lemon cream cheese bottom layer topped with a lemon meringue layer. This pie has the color and consistency of the cream layer but I could taste the cream cheese in the Perkins pie. That would be an easy enough fix with this…either add more cream cheese or don’t add as much lemon juice. After such a critical critique I have to rate this recipe a 5. I love lemons and tend to get annoyed when lemony offerings don’t deliver on the flavor. This flat out punches you in the face with lemon. It’s definitely a keeper. Kris, I’m glad to hear the pie texture came out perfectly. Thank you so much for taking the time to make the recipe and report back! Hi there. I made this for one of our Thanksgiving pie options. I have a very deep pair dish, so I made 1.5 times the recipe, and used my trusted standard Betty Crocker pie crust. The flavor of the cure was spectacular, and once the cream cheese was incorporated – wow! To die for! My only issue is that it didn’t set up as much as I’d have liked. I am an experienced cook and baker, so I am not sure what went wrong? Any advice? I’m planning to make it again, but want it to firm up more…. Hi Donna! I’m so glad the flavor was spot on for you! It is a softer pie, so it wouldn’t get completely firm. Otherwise, I think it stayed extra soft because of the increase. It’s harder for a larger amount of filling to set. Es deliciosa la receta, a toda mi familia le gustó Muchísimo !! Thanks Lourdes! I’m so glad the recipe was a success! I’m happy to hear it’s a new favorite, Amber! Thank you so much for sharing this review! This is probably the best thing that has ever happened to me! Thanks for sharing a world class recipe! Stef, I’m so glad you enjoyed the recipe! I’m afraid I don’t know how the recipe would turn out with a sugar substitute—I have not tried any myself, so it would be a major experiment, and I can’t guarantee that the pie would turn out. I was reading the comments and noticed that several people mentioned that it didn’t firm up as much as they would like and suspected that using the less fat cream cheese could be the cause. When I make a cream cheese frosting, I cannot sub the low fat cream cheese for the full fat because the frosting will not hold its shape very well. I think I will try this with the full fat cream cheese and see what happens. Thanks for the beautiful pie. Haven’t even tried it yet and my mouth is watering. Gwanna, full fat will have a firmer texture if that is what you are after. I hope you enjoy it and would love to hear what you think! Sue, YES!!!! So happy you all enjoyed it. Thank you for taking time to leave this stellar review too. It means a lot! I made this exactly according to the recipe and it only filled the 9″ deep dish pie plate halfway. Very tasty, but what happened to the volume? Hi Barbara, it’s hard to say what may have happened without being in the kitchen with you, but it sounds like the eggs may not have been beaten enough to achieve the full volume. I’m glad to hear it was still tasty, and I hope you were able to enjoy it. The recipe sounds delicious and I will make it soon. My concern is the problem others have with the filling not setting up quite well. Could you add an extra egg yolk or use xtra large eggs to aid in firming it up? Thank you for the answer and the pie sounds really tasty. Hi Carol! The current number of eggs in the recipe is the only way I’ve tested it. You could try using full-fat cream cheese, which would be firmer. Overall, it is a softer, creamier pie and has more of a pudding-like vs. cheesecake texture. We love it though, and I hope you do too! I love this pie! I like to make a cookie crumble crust for it though. I use lemon bar cookies. I’ve made it several times and everytime it’s a hit! Thanks for sharing it! I’m glad you enjoyed it, Kat! Thanks for taking the time to report back! I just got done making this pie and it’s chilling in the fridge, so I can’t speak to the completely finished pie, but I had the same issue as others with the cream cheese not incorporating well. I used full fat cream cheese that had been out all day, so it was very soft. I swapped out the paddle on my Kitchenaid for the whisk and beat it until it looked smooth, but I could still feel little pieces of cream cheese when I tasted it. I do like the flavor though. Thinking of the texture of cheesecake filling, I think the next time I make this I might try pulling some of the sugar out of the lemon curd and mix it into the cream cheese to try to smooth out the cream cheese before incorporating the two. Hi Glenna, thanks for sharing your notes! I’m so glad you enjoy the flavor, and I hope the pie is a hit! Made earlier with a gluten free pie butter crust. The custard tasted very sweet but with a nice lemony sharpness – used full fat cream cheese for added richness (as its the holidays) .. Hopefully guests enjoy it :). Although if I make it again I’d probably reduce the sugar from a cup to either 3 1/4 or perhaps even to a 1/2 instead of a full cup. Thanks for sharing your recipe :). I am so happy to hear that you all enjoyed it Saoirse! Thanks for sharing your review! I made this yesterday and loved it! I followed the recipe exactly except I did use full fat cream cheese. The texture was divine and I will definitely be making this again. When I whipped the cream, I was a little worried that it wasn’t sweet enough, but paired with the sweetness of the lemon filling, it was just perfect. Andrea, I am so pleased to hear that this was a hit! Thank you for sharing!! My wife knows I really like lemon desserts so she made this pie. Amazing! So light but rich with lemon flavor. Thanks for sharing this recipe Erin. Steven, I’m glad you enjoyed the pie! Thank you for taking the time to leave this review! Question: Do you only cook the custard until it is thick (with little bubbles still seen from the eggs) or do you continue to cook until translucent, shinier, creamier texture like a curd? Sara, I cook until the custard is thick and rich, similar to a pudding.